I've been somewhat AWOL for the last couple of months in terms of blogging. This is down to a number of reasons such as university assignments, my job, enjoying time with friends and a simple lack of anything interesting to write about! However, once again its Summer, which means my flatmates have deserted me for a few months and in between working and spending time with my boyfriend, I find myself EXTREMELY bored. Therefore, I have vowed to try and keep up with this and write a few blogs over the next few weeks/months. At least then I will have spent my time off doing something slightly productive and also when I go back to uni in September, I won't be a complete writing spazz because I haven't entertained a keyboard in months. Me and Boots haven't been the best of friends lately as I stupidly lost my Advantage Card a few months ago and therefore stopped going in on a daily basis (probably for the best!). However, I have been in on a few occasions accompanying friends and instead of walking out with a basket-full of cosmetics each time, I have just bought the odd item here and there, so I thought I would start my new blogging lease of life with a review of the products I've purchased! The first polish I bought was Rimmel Lasting Finish in 700 (Block Your Green). 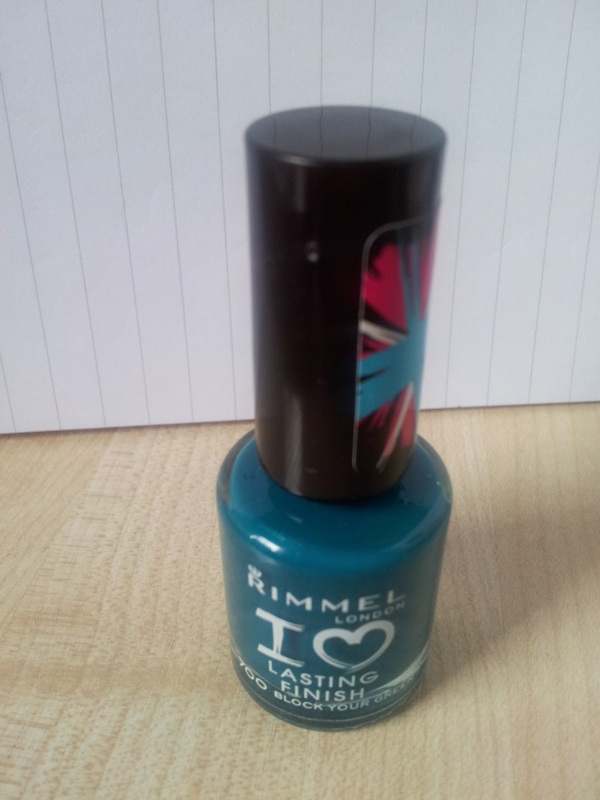 It is a vibrant greeny blue colour, perfect for Summer nails, and as part of Rimmel's Lasting Finish collection, it glides on easy enough and takes no more than two coats to achieve a good, solid colour coating. The picture below doesn't really do the colour justice (I really need to invest in a camera! ), it isn't as teal as the image makes out. It is impossible to capture the exact colour but it has more of a green undertone and just screams Summertime. The nail polish is a great consistency and goes on your nails in the exact same colour you see in the bottle (unlike many!). As a lover of black and red nails, it is unusual for me to wear bright colourful shades but this is one that I definitely don't mind wearing. However if I had to say one bad thing about this particular polish, it would be that it is a nightmare for staining, so you really need a base coat underneath. I was channeling The Hulk for a few days after removing the polish, as it stained the tops of my fingers really bad and wouldn't come out of my nails for a while either. All in all a great purchase at the measly price of £2.99, and I will continue to wear it over the Summer months regardless! Orange, I am truly, madly in love. 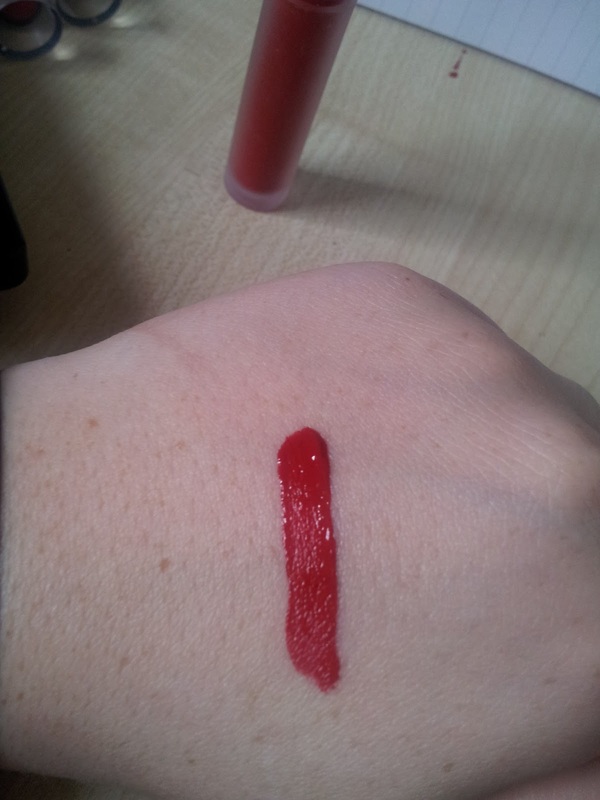 Even though the name suggests it is an orange shade, it is actually a really vampish deep but bright red. 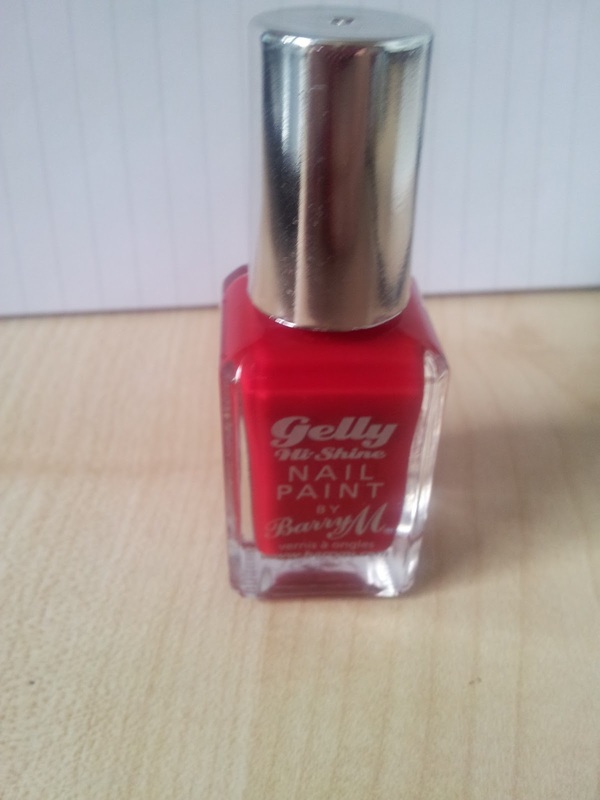 And I adore the colour so much, it is now my go-to red nail polish. Like all the other Gelly Hi-Shine polishes, this is good to go in two coats and I personally don't even bother with a base or top coat as it doesn't stain and the finish you get with these polishes is phenomenally shiny. I can see this polish being used up very soon and I will most definitely be re-purchasing it, as they are only £3.99 yet leave you with a perfect salon finish. 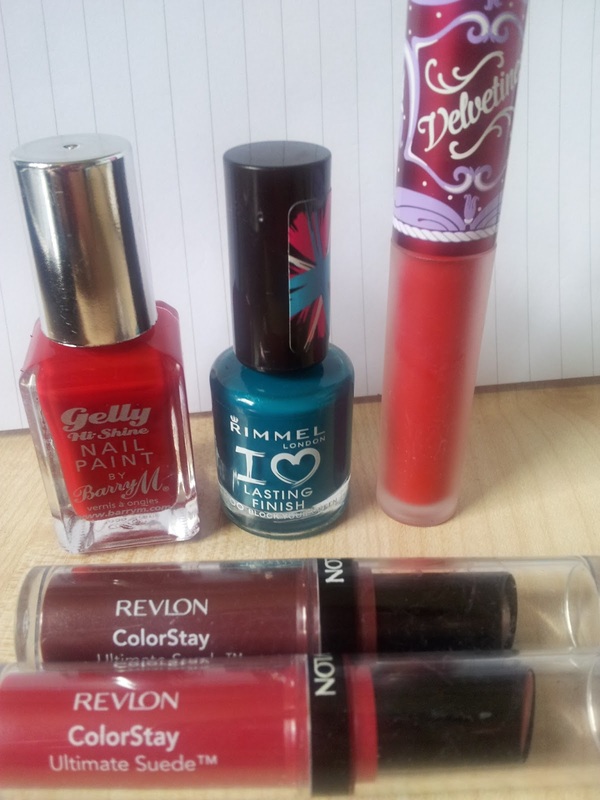 As well as nail varnishes, I have recently become a bit obsessed with lipsticks too. The first two I picked up were from the new Revlon ColorStay Ultimate Suede range. I bought two shades, Backstage and Trendsetter. Backstage is very much my colour, as I am really into dark lipsticks and this is a mahogany/plum shade. Trendsetter on the otherhand is quite girly for me, as it is a red shade with pinkish undertones, however I also really like this shade on myself. 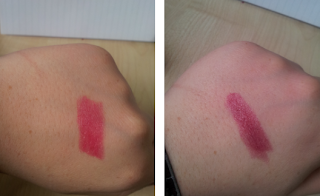 As someone who accidently rubs off her lipstick all the time, I actually found that both lipsticks stayed on for quite a long time, even in the sun and whilst eating and drinking. Not only this but they were quite moisturising, and had a nice feel, in that they weren't too dry or too wet but you could tell that they were still on your lips, which is good for me, because it indicates whether or not I need to reapply. Which in this case I didn't. 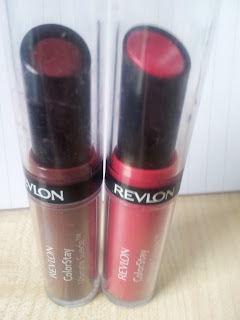 I got both these products when they very first burst into Boots and I think (but I could be wrong) that they were on offer for £6.99 but recently are around £8, which is a little pricey for a lipstick but I personally love them and think its worth it. Last but not least, I watched a few Youtube videos about the Lime Crime Velvetines lip glosses and was intrigued to try one of them out for myself. 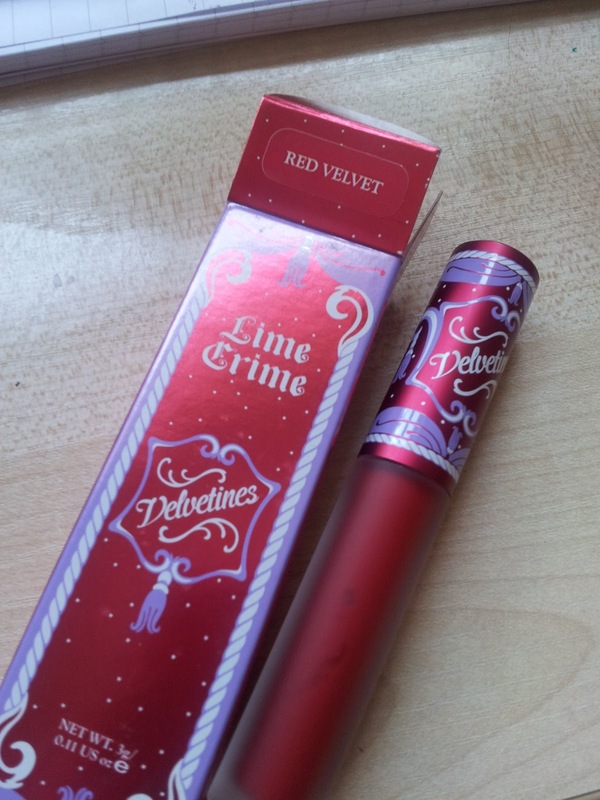 I purchased Lime Crime Velvetines in Red Velvet from an online seller, as I think it is an American brand (? ), for around £15, which is a lot, but I felt the need to invest. Before even opening the product, I fell in love with the packaging, because it was so girly and pretty, so major kudos for that one, Lime Crime. Now, I'm not a fan of lip glosses as they tend to be a bit girly for me and I don't like the stickiness of them, however this one is extremely different to any other. The promise of Lime Crime Velvetines is that while they are technically a lip gloss as they come in the form of a wand and are shiny and extremely pigmented, once they have actually dried to your lips, they are completely matte. I had been trying to find a specific deep vivid red for quite some time in Boots and Superdrug but can never come across one that suits my skin tone, so thats why, I opted to try out this offering from Lime Crime. I love the colour, it is exactly what I'd been looking for, however I personally couldn't get to grips with the consistency and application of this product. 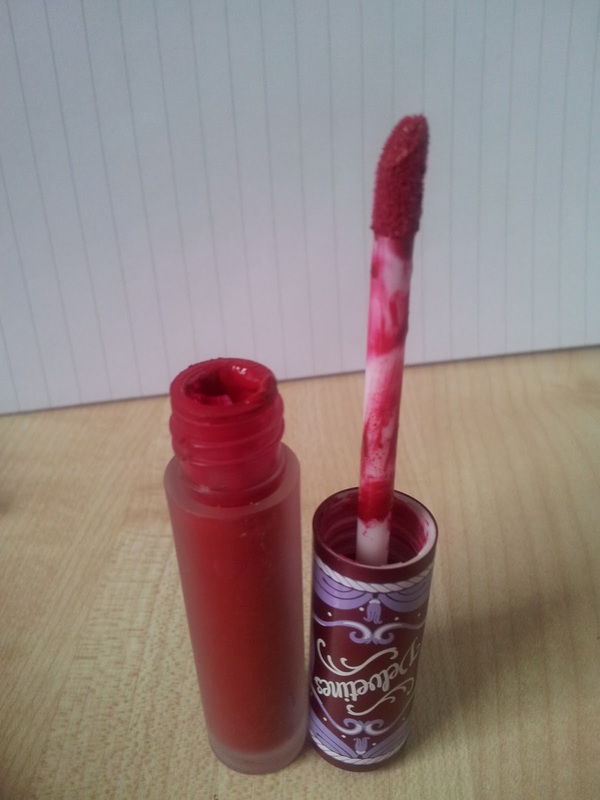 Because initially it goes on very shiny and extremely pigmented, you have to take great care applying it, and for someone with really small lips, this proved quite a task and it didn't suit me personally at all, which is a massive shame. If you have fuller lips and don't have any difficulty applying lipsticks/glosses with care then this would probably be a great investment, however if you're like me, unfortunately this one can afford to be overlooked. And there you have it, my recent cosmetics purchases. I did not expect this to be so long, but I hope I have given any cosmetics lovers out there a fair and decent review of each product. And I hereby pledge to do some more posts in the coming weeks and not leave my blog unattended for too long this time! I've been wanting to try out Barry M polishes for a while now :) Thanks for the review! Wow the colour pay off from that lipstick is soo rich!